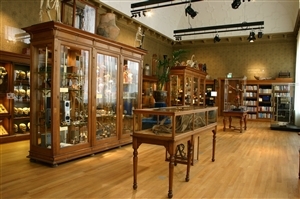 The Museum's Gallery on the upper floor is organized as a classical museum's room with display cabinets in which the top pieces of the university's academic heritage as a showcase for scientific research through the ages. In this room you will find objects used, and created, in research that took place at this 400 year old university. Here you will see the first electromagnetic car in the world, the mummy 'Janus' from Egypt, as well as anatomical preparations and models, medical en astrological instruments, objects from the ethnological collection and lots more. The audio tour 'Surprising stories from the University Museum' takes the visitor on a journey along intersting objects and surprising stories behind the head of an orang oetang, the first electric car or the Egyptian princess that turned out to be a woman. The audio tour is free. Visitors can listen to the audio tour on their own smartphone by downloading it via the iziTravel app. You can download the app before your visit, or use the free wifi at the entrance desk of the museum to download the app. A free booklet with highlights from the collection is also available at the entrance desk of the museum. Last modified: 08 November 2017 4.14 p.m.